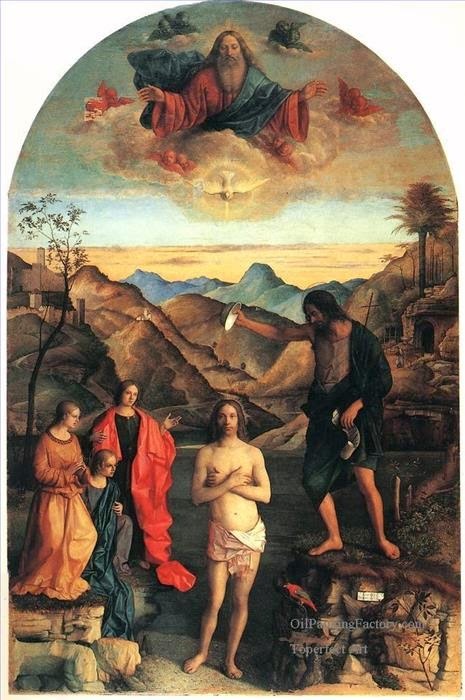 This is the Baptism of Christ by Giovanni Bellini. It was painted at some point between 1500-1502 and can be found in the Santa Corona church in Vicenza. It is clearly a stunningly beautiful work of art, notable for the striking realism of the figures, the beautiful symmetry (you can draw a line down the painting that passes through each aspect of the Trinity and divides the painting exactly in half and the mastery of perspective (complete with the observation of how the mountains in the background appear slightly blue tinged). As part of my undergraduate degree, I spent four months studying the Renaissance in Venice. I was mostly studying history, but one of the great things about that module (apart from being forced to spend four months living in Venice) was that I had study art history too. At one point during the term, we were actually obliged to spend a week travelling to visit some other treasures of the Italian Renaissance. So I went to Florence and Rome. As you can imagine, it was hellish. Anyway. I got to see some of the most beautiful art ever created and discovered that - in common with everyone else with eyes - I loved Michelangelo's sculptures, especially the Pieta, Moses and the extraordinary Slave Cycle, an unfinished set of sculptures where the figures seem to be bursting out of the raw marble. I'd never really stopped to look at art like this before, and now I was really getting the chance to appreciate some of the finest ever created. That was more than twenty years ago, but I like to think that the fire that time in Italy kindled in me has never gone out. I'm not claiming to be an expert or anything. I just like it. It's not all comic books and brain melting heavy metal in my head, you know. But can anyone explain to me why it is that, when I look at this masterpiece by Bellini, I mostly think how Jesus looks a bit like a sheep? Is that just me? There's definitely something sheep-y about his haircut and the expression on his face. Just me? Well, okay then. As you were. He looks particularly well-fed in that painting, compared to most depictions that I've seen. Also, He seems to be rocking a 1986 Don Johnson beard stubble. I guess Mary's cooking must have been pretty good, huh? I guess many depictions show him in more trying circumstances, though. At this point, they're all ahead of him. His first miracle was the water to wine..... and if I met someone who could turn 100-odd gallons of water into excellent wine, I reckon I might follow him too.